For many years, I've been hunting down molecular structures for the classes I teach. On Saturday afternoons, I'll be downloading structures from the NCBI, looking at them in Cn3D,and calling my family over to see something really interesting that I found. Sometimes they humor me. Sometimes they yawn and ask if they really have to. 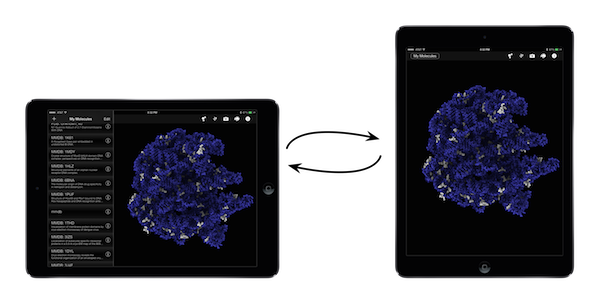 But since we started working with Molecule World, it's all changed. My husband is showing molecular structures to total strangers in the airport. My kids are talking to their friends about the app. One of my daughters has brought up the idea of majoring in chemistry (well, that's probably a coincidence). And our development team has been out talking to teachers. 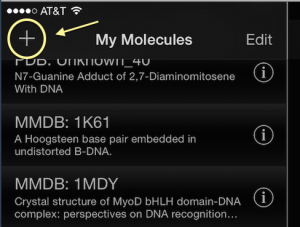 Molecule World™ is the first iPad app that is really going to help students learn about the chemical properties of amino acids and nucleotides and better understand the connection between structure and function. I've been working with molecular structures for over a decade and I'm learning unexpected things just by looking at structures in Molecule World. 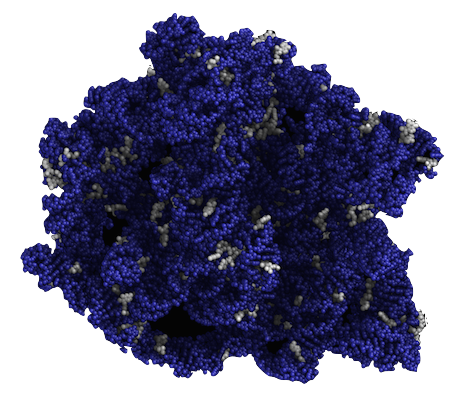 For example, here is a structure of the 23S ribosomal RNA from E. coli. 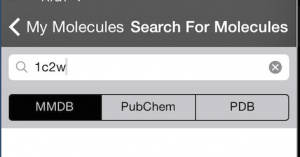 I downloaded this structure from the NCBI on my iPad, opened it in Molecule World and colored it by hydrophobicity. 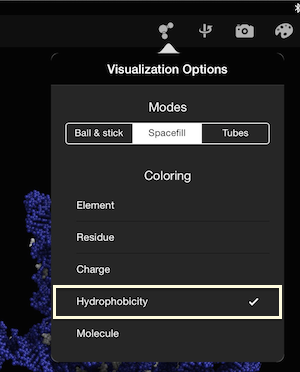 When we added the hydrophobicity coloring option to Molecule World, I decided that all the charged amino acids and nucleotides should be dark blue. I also set the coloring option for unknown residues to be white. As a consequence, all the bases that are chemically modified in some way, through methylation, or some other modification, or unable to be identified by Cryo EM show up white. It's been quite a surprise to look at ribosomal RNA and see just how of the bases are chemically unusual. When you look at these bases in the RNA sequence, you don't ever see this information because there isn't a good way to represent it in the nucleotide sequence. But we can see this information in the structure. I think this is pretty neat. If you want to see this for yourself, this PDB ID for this structure is 1C2W. 1. Hold your iPad in a horizontal position and touch the +. The structure name will appear in the list. 3. Touch the name of the structure to download and view. 4. 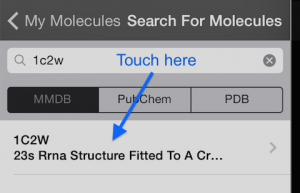 Touch the atom icon and choose hydrophobicity to change the coloring style. 6. Touch the structure window to apply the change. You can also view the structure in the full screen by turning your iPad to the portrait mode. 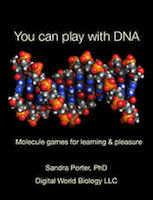 I hope you'll have fun exploring with Molecule World, too! Molecule World™ was developed with funding from the National Science Foundation (SBIR IIP1315426). Any opinions, findings, conclusions, or recommendations expressed on this website are those of the authors and do not necessarily represent the official views, opinions, or policy of the National Science Foundation.